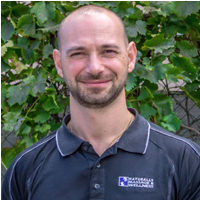 George is a qualified Remedial Massage Therapist, Naturopath and Personal Trainer and was an educator in Massage Therapies and Anatomy and Physiology at a private college for several years. George began his remedial therapies journey over 17 years ago! With a lower back injury that he managed to resolve using his own personalised system, incorporating massage, needling, stretching, movement, and training techniques, he then began applying these principles of combined treatments to achieve fast and long lasting results for his clients, improving their ability to move and reducing their pain. George also has a high focus on educating clients in how they can take control of their lives again, working with them to make life altering lasting changes. Pain and restriction can come from a number of causes including injuries and postural issues. Being able to identify the causes, and the habits and imbalances created, is the first step in coming up with a way to develop personalized treatment strategies. Educating patients in how they have come to this point is extremely important, as understanding your own body is necessary to be able to change bad habits and move towards long term relief and benefit. George also provides mentoring to the practitioners consulting at Naturally Massage & Wellness to provide the industry with highly qualified professional therapists that provide AMAZING results to the community!